A few weeks ago, the New York Times ran a front-page article about president-elect Donald Trump’s public browbeating of Chuck Jones, president of United Steelworkers Local 1999, which represents the workers at the Carrier plant where Trump claimed to have saved jobs. The first paragraph of the piece referred to Jones as a “union boss,” as did the headline in the online version of the piece (“Trump as Cyberbully in Chief? Twitter Attack on Union Boss Draws Fire”). The Public Editor truly showed what contempt at least some people at the Times have for the labor movement and for workers. It made me miss the excellent former Public Editor, Margaret Sullivan, who is now at the Washington Post. “‘Flummoxed’ synonyms according to Merriam Dictionary can mean distracted, confused. I did not read either of those words into the letter written in response to [the] article referring to union leaders as ‘union bosses’. 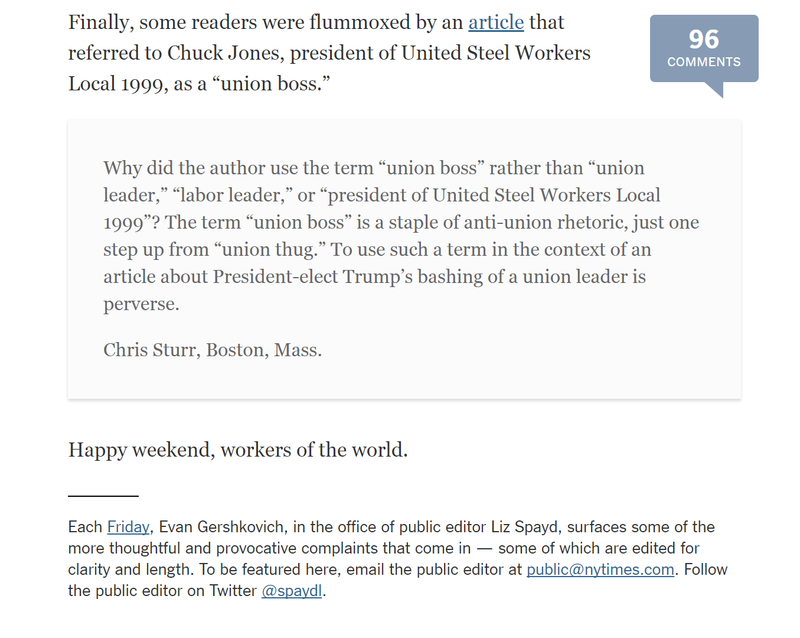 “Obviously, the Times Public Editor appears to think that ‘union boss’ isn’t a pejorative; otherwise, she probably wouldn’t have ended today’s column with a barely concealed bit of sarcasm. “Ms Spayd [the Public Editor] reveal[s] what a right-wing hack she truly is with this reference. Chris Sturr writes in to protest the use of the term ‘union boss,’ which he rightly points out is used by people who are hostile to unions. Seriously, Liz? You treat someone standing up for union members with a sleazy reference to communism?